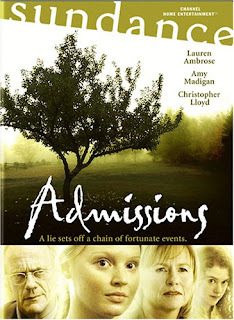 Admissions is a fine drama even though they're are some problems with the ending. Lauren Ambrose plays Evie who is trying to avoid college. To make her overworked mother not notice, she makes up poems that everybody thinks her mentally challenged sister wrote. All the acting is first-rate especially CT's own Lauren Ambrose and Amy Madigan. They both put in great performances. The climax is also very powerful. There are only two bad parts. First is the character of Stewart Worthy played by Christopher Lloyd. His part is underdeveloped. The other weakness is the ending. It goes around in circles, which I didn't expect with the 84 minute run time. Besides that, the movie is definitely worth watching.